How Do I Control My Store's "Order By" selections? When a customer clicks on a category on your website, they have a choice as to how they would like to sort the products they view. We call this the "Order By" feature. For example, a customer may choose to sort the products by Low to High in price, or alphabetically by name. 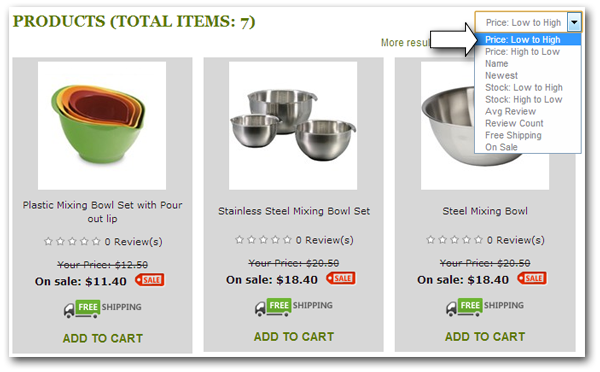 This article will show you how to customize the "Order By" feature to suit your web store's needs. 3dcart allows you to choose which "Order By" statuses you would like to display to the customer. Within the "Home Page" section, locate the "Hide Order By" checkbox. Next, click on the "Edit Settings" link directly below the checkbox. Check the "Visible" checkbox next to the product sorting status you would like to display. Edit the sorting number in the Sorting column – smaller numbers will display before higher numbers. 3dcart allows you to change the "Order By" status names to anything you would like them to be. You can also create new status names in the extra_field_ fields. These extra status fields will sort from custom fields you have created for your products. For example, Material if you designate item material as a custom field for your products. Edit the status name in the Status column. If using the extra_field_x options, the status name should correspond with the name of the custom field you have created for products. This step is only for those that have desgnated custom fields for products. Also note that this sorting will be applicable to Extra Fields 1 through 5 set at the product level via the Product's Information Tab.